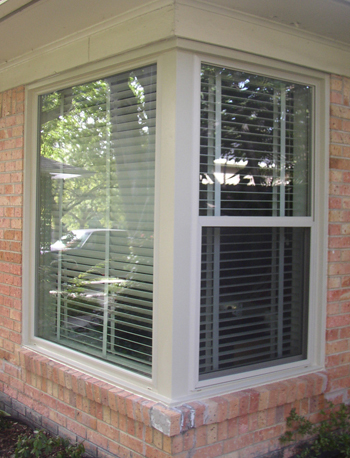 Vinyl windows have become the primary product for replacement windows in Dallas and Fort Worth as well as North Texas and most of the South. Vinyl windows are more cost effective than wood, more energy efficient than aluminum and heads and shoulders above composites as far as value and bang for the buck. Aluminum builders grade windows haven't been used at all since 2009 when Energy Code Requirements precluded their usage due to conductivity even in the upgraded thermally broken style. The world had made the jump to vinyl windows. VInyl windows are cost effective, durable and able to perform four times better than most builders grade windows while offering a lifetime warranty on glass seal failure as well as locks, sash balancers, weatherstipping and other parts and pieces that were notorious for failure in standard builders grade type windows. Rear viewing windows have gotten away from grids and operating styles over time. Now the trend is towards large open vinyl windows with no horizontal lines and a clean open look. We spend most of our time in the rear of the home and an open look tends to be more inviting, offers a bigger look at the yard and brings outdoor pools and living quarters in closer, at least in appearance. Windows like these do require tempered safety glass to meet code requirements but the look is one of a kind. Truly vinyl windows have come a long way. White was popular for years in standard builders grade type windows but can be too staunch on homes removing bronze windows. Tan and Beige give a more relaxed look than white and now have a more grey based color tone as opposed to the yellowish colors of years past. Popular materials to build them out of include wood, smooth fiberglass, textured fiberglass, aluminum or vinyl clad wood doors and of course, steel. Smooth Fiberglass is probably the most popular product. Fiberglass is 4 times more energy efficient than wood and with the durability of fiberglass these can last for decades. Our primary provider for these is ThermaTru but all doors are not alike, not even all ThermaTru Doors. ThermaTru offers steel french doors, smooth fiberglass and textured (wood grained) fiberglass. They also offer amazing factory painting and staining but those can seem a little pricey and cost prohibitive. ThermaTru is very proud of their factory finishing. It's expensive to the tune of about a thousand dollars a door. Usually a local painter will come in at $250 to $350 so you can see why the factory stain or paint isn't as popular as one would think. That being said, they look amazing like a piece of furniture and the finish should last for decades. It's a truly upscale look with no rivals as far as looks go. All doors can have grids or no grids. Grids can be between the glass or what's called simulated divided lite grids which protrude from the surface of the glass. This was a great project using NT Window Energy Master vinyl windows with triple glazing and Krypton Gas. No they won't keep out Superman but here's the deal, they will lower a mid ranged type vinyl window from a .29 U value to somewhere around a .18. For Dallas and Fort Worth it may be a bit of overkill but it's super quiet and for sure the state of the art in vinyl replacement windows. Solar Heat Gain Coefficient remains about where double paned with Argon are at around a .21 or a .20 with grids but the heavier glass package and the lower U value are really the best that the industry can offer as far as a high performance vinyl window. 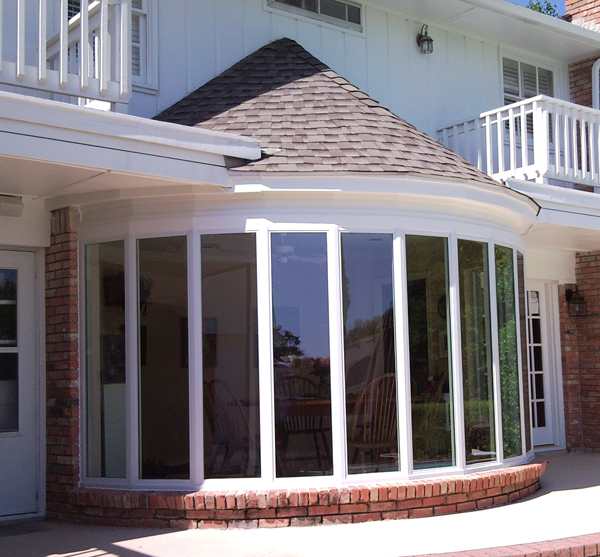 The additional cost to do the super high grade glass package is about $250. This is comparable in cost to when we use a laminated glass (also triple paned) package. That package won't lower U values as much but is a much quieter glass package because of the plastic film. Laminated glass is what is in the windshiled of your car. You have to admit, you never hear the wind from inside the car. These two are considered the highest end type glass packages that we can find in vinyl windows to date. Interestingly it's the same frame as we see in a good mid range cost vinyl window so if you go standard or go super glass you get the same frame, same warranty, same replaceable components and weatherstripping in any of the three options. The simulated divided lite grid package is something a little different than grids between the glass. Most grids you see in your neighborhood are between the two panes of glass. This is how it's been done since the invention of double paned windows back in the 70's. Standard grids only add about $30 to $35 per window in cost and these run up to $20 per lite (each little square). The real advantage is that because these are surface mounted on the face and the inside of the home, they don't have the color that is added by the Low E coating that is seen in a modern vinyl window with grids between the glass. This simulated divided lite grid is costly but more appropriate to those who find the color of the glass offsetting and also in higher end homes that need that need that more upscale look. I also find that we use them in more historical homes that used to have real true divided lites and the age or style of the home make it more appropriate. This one is the Alside Ultra Max with simulated divided lite grids. This is a long time favorite of mine and their top of the line offering from AMI. Associated Materials Incorporated. One downside to window research is that many windows do what is called "rebranding" Making the same window with lots of different names to prevent cross referencing and comparison. AMI is actually sold under several names. We are proud to have the best reputation in North Texas for our quality of install. We do the best work and were named one of the top 5% of providers by Expertise.com in 2017.
grids, panes, simulated divided lite, true divided lite, divided lite, windows, Alside, Ultra MaxContact us! The devil is always in the details. On this shot it's easy to see our sealant bead. When done well by someone who really cares they should be as small as possible to still seal the window and straight and smooth. I find that most bad looking installations are about the caulking beads and the trim work. We use a special technique that includes not only great care and control on the application itself but also a foaming glass cleaner and hand tooling. Yes it takes longer and costs more but the end result is as close to flawless as humanly possible. I have seen 20 year veterans surprized at our caulking technique and in all honesty had been installing for two decades before I discovered the advantage to this approach. It keeps the caulking in place and off the fingers and prevents it from smearing all over the vinyl window or the brick or in this case, the marble that the window is sitting on. 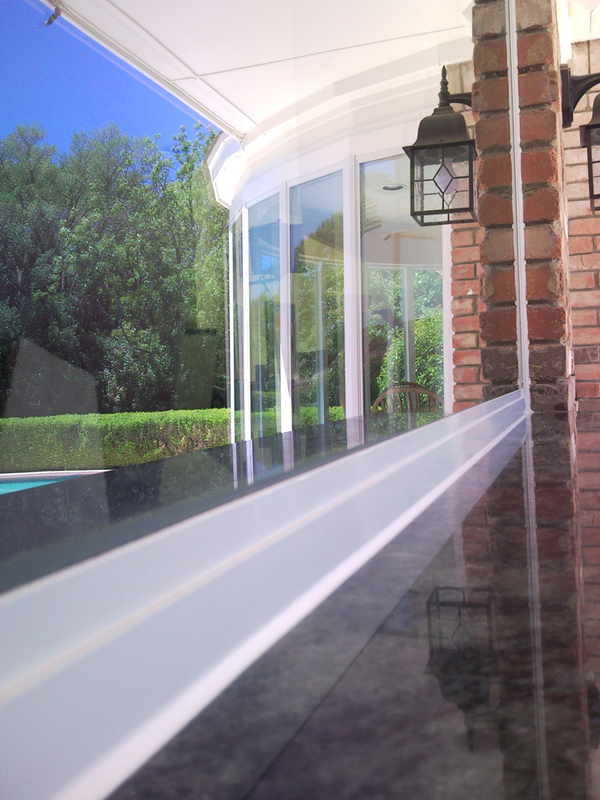 vinyl, window, installation, caulking, installers, contractors, workmanship, craftsmanship, artisan Contact Us! This shot shows it well. On a good install all the grids have to line up. This is not always easy and is not a detail that many window installation contractors spend much time on. Modern homes are very expensive and need a real attentiveness to details and to workmanship. We lay out and design all grid configurations very carefully when measuring and double check all production notes carefully to assure that your new vinyl windows will look exactly like they should. This picture also shows that the grids between the glass do show a good deal of color from the tint that is naturally in Low E Glass. Some Low E windows are blueish and some more green and we even have several glass packages that have a little less color but the trade off is that the less color we see, the less energy efficient the vinyl window is. vinyl, window, grids, installation, measuring, alignment, expertise Contact Us! This is a casement window. It cranks out like an outswinging door with a folding handle and a latch type lock. This approach eliminates the horizontal line that we see in windows that go up and down (single hung windows and double hung windows). The screen is located on the inside of the home and is removable to make it look like a solid picture window even though it does open for ventilation. I use these a lot on the window above the sink to provide a better view when we're doing the dishes. Interestingly enough, since it swings open, it also provide double the ventilation as a vertically operating vinyl window and since it hangs out from the house it also can catch a breeze on a nice day and really air out the house in a way that windows that go up and down simply cannot. These can come as single vinyl casements, double vinyl casements and triplie vinyl casements which is a favorite to put in place of a twin window in the kitchen to open up the view. 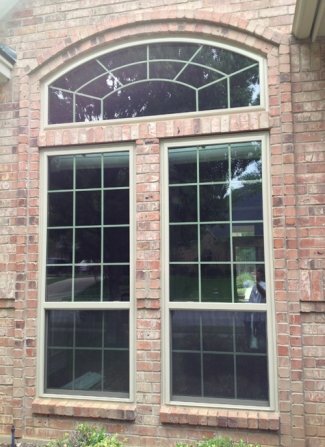 Locally made here in the Dallas / Fort Worth area this is a great window from a great window manufacturer. They are produced in Mansfield Texas with Cardinal 366 Low E Glass right out of the Cardinal plant in Waxahatchie. Cardinal 366 is the highest performing Low E Glass available in America and the close proximity to Dallas helps us keep all the money right here in North Texas. Also because shipping is minimized it also provides a great window at a great price point with exceptional value to the end consumer. This project was off Campbell and Preston Road and the style and look is very appropriate to home all the way up to a million dollars plus in home value. This home was in the 800's when we started and has increased in value by 20% in five years. We really like to think our vinyl windows help that to happen. 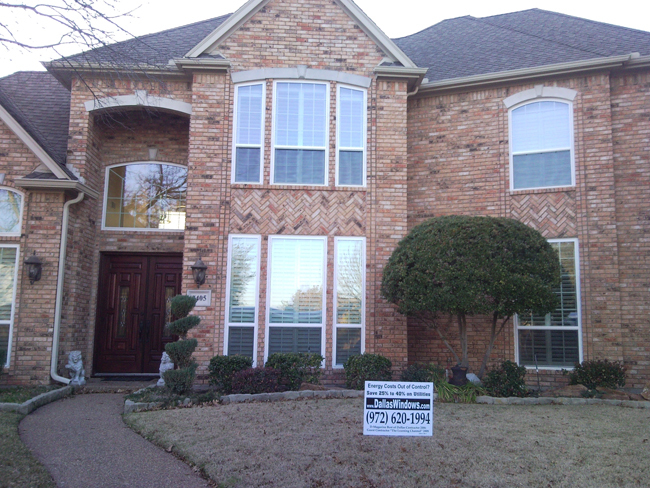 vinyl, window, windows, grids, NT Window, North Dallas, Energy MasterContact Us! This was a six lite bow window that we converted to a three lite bay window. Sometimes this is a great way to maximize glass and minimize frame size for a more updated look on a home window. This one in Beige with grids left all the brick in place and required just a little work to make the tops look right. I did this one for a house flipper and because of our low overhead and minimal marketing costs we are a house flippers dream. According to Remodeling Magazine, an "average" window costs around $1000 installed and is worth around $743 when the home is sold. We actually come in cheaper than that at an average cost of around $643 installed for our average vinyl window. To be clear, there are window installation companies that will do a cheap product and a cheap installation and come in at around $450 but the longevity, attention to detail and the overall quality of the window and the long term value and appearance of the product is not the same as a great mid range type vinyl window. Overkill? Perhaps. Awesome? Yes without a doubt. Bay Window, Bow Window, Windows, Vinyl, Alside, MezzoContact Us! This is a favorite of mine. I like them a lot as single hungs and really hate them a lot as double hungs.. The window itself has a comparitively small profile frame while still maintaining a 3 1/4" thickness from inside to outside. The frame profile is about 2 3/4" at the outside face. By comparison the double hung has a frame of almost FOUR inches at 3 3/4" profile on the face. To me that's too much frame. This was a house we did in Coppell. I do a lot of the nicer homes out there. The center top window we chose to do as a one piece, continuous arch half circle instead of making a rectangle and a half circle mulled together for a two piece unit. It really updated the look from the late 80's style that was there originally. The three point is required on the tall ones and adds about $800 to the cost of a typical door. Needless to say they are not for the budget minded remodel but they are for sure the top of the line French Door Product. This model has the screens on the outside and they slide up and down as well as being quite a bit stronger than standard screens with a fully extruded aluminum screen frame. That's a great addition as far as options as it's really strong and hard to bend up unlike the typical roll formed screens that most window manufacturers use. Alside, AMI, Revere, Vinyl, Window, Single Hung, half circle, extruded screen, white, gridsContact Us! 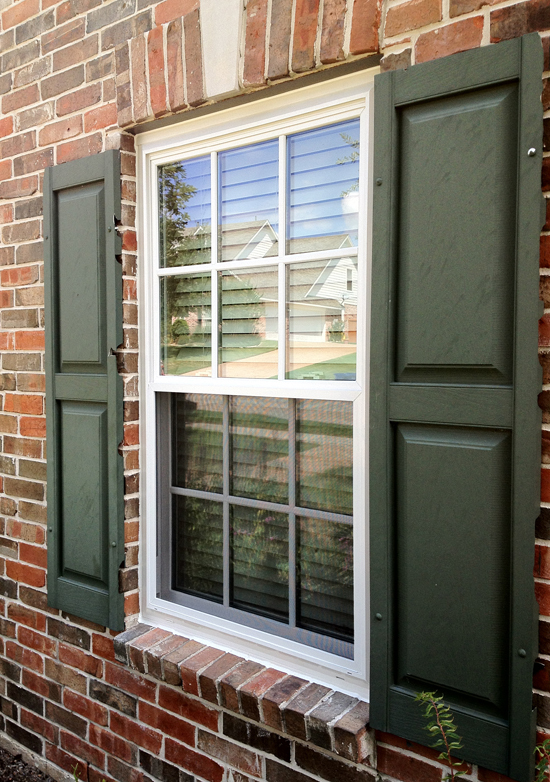 The double hung is a window that operates from the top and the bottom. The screen can slide up when using the top or sit at the bottom for standard usage. 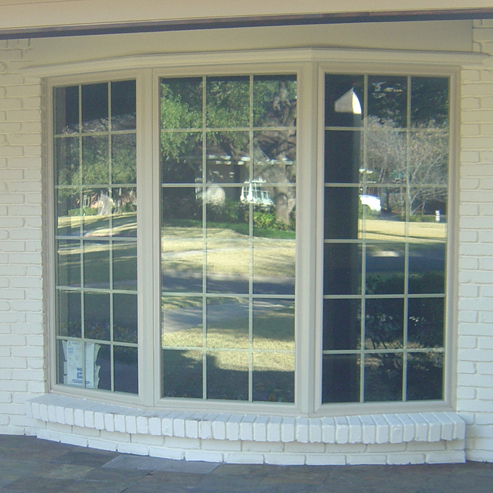 This one was in Winnetka Heights in South Dallas and was so great for this customer that when he built a second floor and expanded the home he insisted on our NT Window Presidential series to match the previous installation After 5 years there were no issues and it was a shoe in that he wanted that high quality vinyl window to match. NT Window Presidentials are also called the Executive and the Energy Master is rebranded as the Traditions. Different vendors will call them different names in order to prevent cross referencing products but we want you know the facts and make a well informed decision no matter what. NT Windows, Energy Master, Executive, Presidential, Traditions, vinyl, windows, replacement, DallasContact Us! 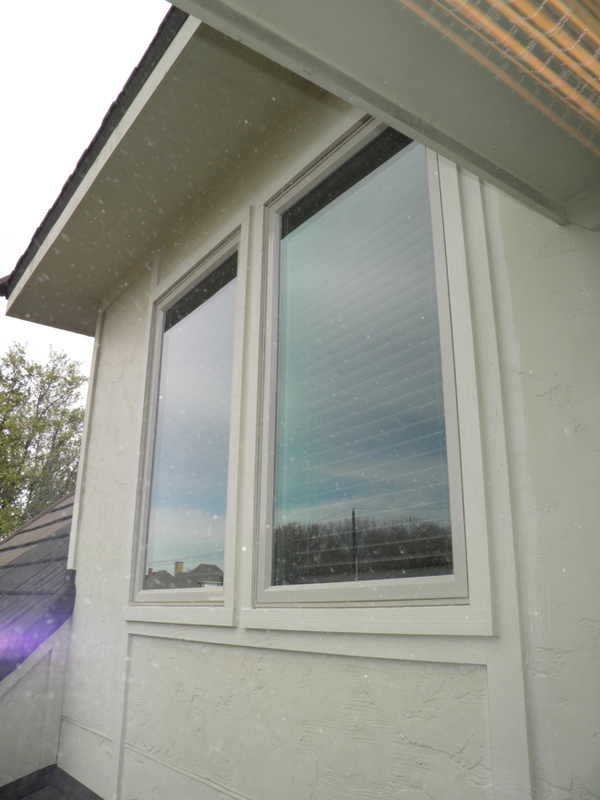 This is another area that sets us apart from other vinyl window contractors. We custom make all trim in a siding break to get perfect results and use factory designed trim instead of cheap glue on trim solutions that most installers and installation providers use. It may cost a little more or take a little longer but there is no comparison to the end result. This is a project that is fifteen years old but a very recent picture. It looked great when we did it and it still looks great after all this time. The windows had to be measured to sit inside the support post and then insulated with spray foam ans trimmed with a custom post covering. In this one we also went around it with a 1" by 1" cap on the bottom for a more traditional look indicitive of the era and the age of the home. It just looked better that way. There is so much to know about vinyl windows that even this well detailed page doesn't tell the entire story. Call us today and let us come help you know all the options and the best way to approach your home and your next replacement window project. Alside, Mezzo, vinyl, replacement, windows, corner, picture window, double hung, trimContact Us! Because frame thickness is such a visual thing for so many home owners, we are proud to offer our Slim Line Vinyl Windows. This is a specialty item that not all vendors even know about much less use very often. We use them in bays and bows to minimize the frame size and provide the maximum amount of glass that can be attained in a vinyl window while still maintaining high performance and longevity in a window with a full 3 1/4" thickness. No one really wants to look at 6" plastic posts in their bay window and we have this great solution to make it about half that. Custom made trim and real attention to detail are why we are Dallas' most award winning window and door installation contractor and why we are considerably better than most at a very cost effective price point. This multi-million dollar home needed to look good out by the pool and we are the provider that is best equipped and most likely to make that happen in a timely and professional manner. 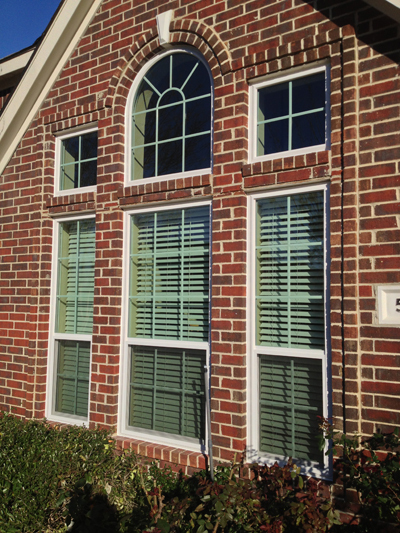 We're proud of how we install vinyl windows and value the opportunity to earn your confidence and win your business. 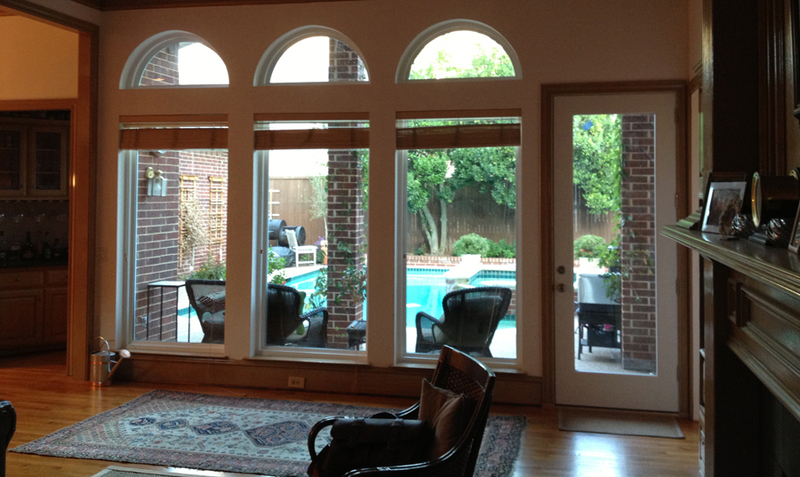 narrow frame, framed, vinyl, windows, window, Dallas, bay, bowContact Us! 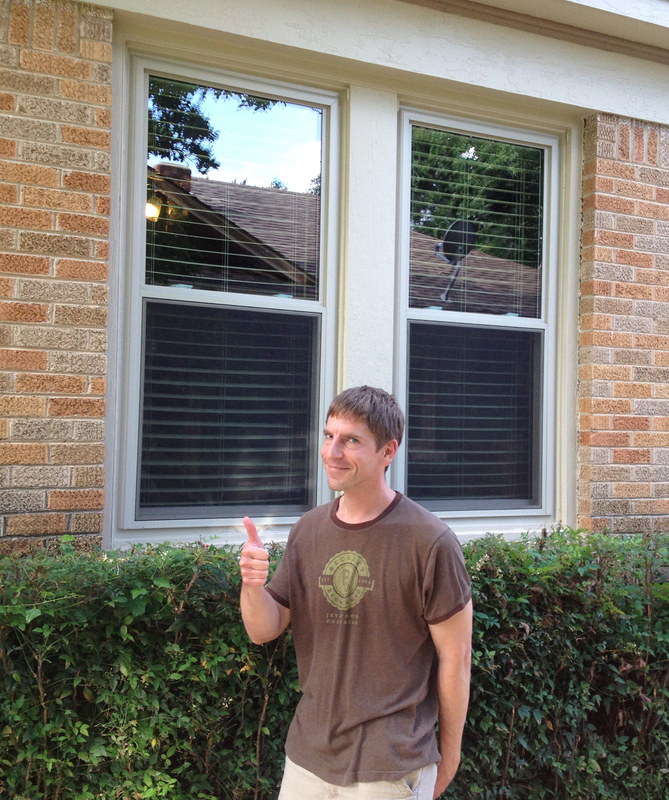 @dallas_windows Sandstone vinyl replacement windows are here! I keep some great stuff on my Google Plus Profile. Between the two profiles they have over a million views. Our site is under construction but we're here to serve! Call us today! Care to learn about Argon Gas and the difference it makes in your replacement windows? Our Blog has some articles about noise reduction and some of our recent projects. Call us and let us help with your home improvement project! Click on the Email Logo! Email us about your project and we'll get right back to you!